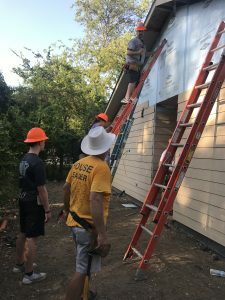 The 100 degree Texas heat normally doesn’t lend itself to working outside; however, when it comes to Habitat for Humanity , the temperature doesn’t matter. 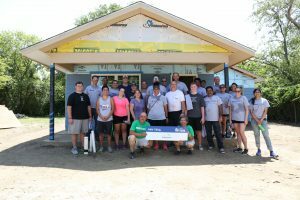 On Saturday, July 22, volunteers, including Altisource , Fannie Mae , and U.S. Bank  were there to help a family plant roots into a community. 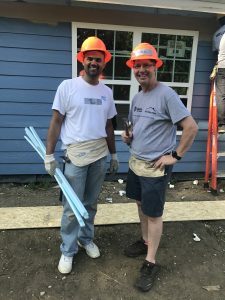 In 2016, Altisource, a provider of mortgage and real estate marketplace solutions, became a sponsor of Habitat for Humanity and began connecting with various habitat facilities around the country where they have a critical mass of Altisource employees. According to Kent Lemon, SVP of Default Operations at U.S. Bank, it gives him and the company an opportunity to give back. Hard-hatted volunteers surrounded the home, some on ladders nailing down siding, others applying weather proofing—but most importantly, within the midst of this organized chaos was the Castillo-Mondrago Family who will have the keys to their new home as soon as construction is completed. As Maria Castillo, the soon-to-be homeowner, explained what it is like to be hands-on in the construction of her home via translator, she began to tear up. Castillo explained that where they currently reside, trash flies under the house regularly and the neighborhood isn’t one she feels her and her family are safe in. To her, this home means peace of mind and tranquility. Much like anyone applying for a home loan, Willison explained that after the lot was purchased by Habitat for Humanity, an underwriting process for approval had to be completed before construction began. Though the loan may be structured slightly different, the family getting the home not only will make mortgage payments to Habitat for Humanity—they require the family to either work specifically on their home, or help another family with their home. John Thibaudeau, Director of Real Estate Asset Management at Fannie Mae, said though the build is obviously part of what they do at Fannie Mae in terms of supporting and promoting homeownership, the fact that they get to participate in things like Habitat for Humanity is remarkable. “For me, personally, I've always been passionate about homes and homeownership outside of my work at Fannie Mae, so to be able to come out here and participate in something that I love and that supports the mission of my company is pretty awesome,” said Thibaudeau. John Golden, Executive Director of the American Mortgage Diversity Council, which is focused on creating a diverse and inclusive mortgage industry for all, was also on hand helping with the build. "I appreciate Altisource for sharing the opportunity to make a meaningful difference in the lives of others,” Golden said. “It’s efforts like this that demonstrate what the industry can do when it works together."